Trim off and discard the wing tips, and cut each wing at the joint so you end up with 1 drumstick and 1 flat section per wing. Place the wings in a sealable plastic bag or a large flat plastic container and pour the marinade over, making sure that all surfaces are coated well. 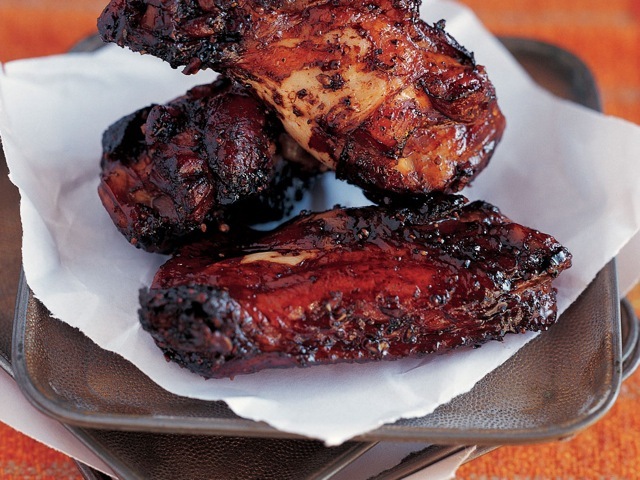 Close the bag tightly and marinate in the refrigerator for 12 to 24 hours, shaking or turning the wings often. Preheat the oven to 450 degrees. Arrange the wings on a rack in a shallow roasting pan. Roast for 12 to 18 minutes, until the skin is dark brown and crispy and the meat has begun to shrink away from the ends of the bones. The juices should run clear when the wings are pierced with a knife point. Sprinkle with the garnishes and serve them up!